Georgette Silva stands next to a steel kiln that is used to heat and mix concrete off of Lualualei Naval Road in Nanakuli. 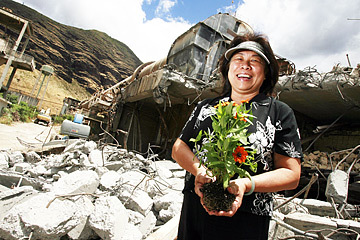 Silva is business manager of Bedminster Oahu LLC, a firm that specializes in making compost out of rubbish. An Oahu company wants to turn household garbage into compost in Nanakuli but faces opposition from Waianae residents, skepticism from city officials and questions from state health officials. Bedminster Oahu LLC says its proposed $20 million indoor facility would convert 100,000 tons a year of garbage into 58,000 tons of compost via its patented "mechanical biological treatment" without smelling up the rural neighborhood. After recycling nonorganic materials, the venture would send about one-tenth of the original trash volume to a landfill, Bedminster International Vice President John Grondin said. 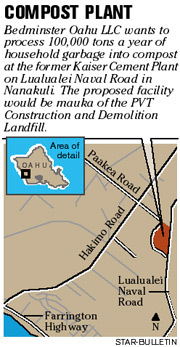 And it would charge trash haulers less than the $91 tipping fee at the city's Waimanalo Gulch Landfill on the Waianae Coast, he said. But area residents oppose increased truck traffic on Lualualei Naval Road and Farrington Highway, and worry that nearby farmers will not be able to sell their crops because of possible airborne contamination, said Cynthia Rezentes, a Waianae Neighborhood Board member and candidate for the state House. Residents have protested that the city Department of Planning and Permitting improperly approved the facility as being an appropriate use of industrial-zoned land. That protest will be heard by the city Board of Zoning Appeals on Dec. 14. "We're questioning them using the agriculture definition of 'major composting' (to describe the Bedminster process) instead of waste disposal," Rezentes said. Bedminster Oahu is a joint venture between Georgette and Joaquin Silva, owners of the trucking company Pine Ridge Farms, and Bedminster International, which operates similar facilities on the mainland, in Australia and in Japan. Pine Ridge Farms bought the former Hawaii and Kaiser cement plant on Lualualei Naval Road last year as a 25-acre base yard for its trucking company and a site for concrete and asphalt recycling, said Georgette Silva, Bedminster Oahu business manager. There are 14 Bedminster plants in operation and six, including Honolulu, in planning or permitting stages, Grondin said. Bedminster's application for a solid-waste processing permit is under review by the state Health Department. If it gets an OK, then the company will have to persuade the city to let it have some garbage. That is an iffy proposition any time before next May, said Eric Takamura, director of the city Department of Environmental Services. That is when a consultant is to hand over a 25-year solid-waste management plan that City Council has been requesting since the Harris administration. Until then the city will not allow any trash haulers to commit to a private venture, because the city might need the "trash flow" to feed a waste-to-energy plant, Takamura said. It is a chicken-and-egg scenario for Bedminster, which will not build the facility unless there is a guaranteed source of garbage, Silva said. The city controls where all private waste haulers dump their loads. Currently, the two acceptable spots for municipal waste are Waimanalo Gulch Landfill, owned by the city and operated by Waste Management Inc., and the HPOWER plant operated by Covanta Energy Co. Though Rezentes opposes putting a composting facility in Nanakuli, she said she would not be opposed to seeing Bedminster locate in a more industrial area. "From what I've seen and heard, the process is potentially viable," she said. » 1. Garbage trucks dump loads on cement floor of a 20,000-square-foot receiving building. » 2. Large items such as tires and bicycles are removed for land-filling or recycling. » 3. Trash goes on conveyor belt to three "digesters," large metal tubes that turn continuously, moving the garbage about 160 feet in three days. Organic materials in the garbage are broken down by microorganisms. » 4. Raw compost out of the digesters is tested to ensure that the 160-degree processing temperature -- created by the microbe action -- kills "a majority of pathogens." » 5. Aluminum, glass and tin are screened out of the raw compost and recycled in bulk. Nonrecyclable items are taken to the city's Waimanalo Gulch Landfill or, if allowed, to a PVT Construction and Demolition Landfill. » 6. Compost is seasoned for six weeks in windrows inside a 35,000-square-foot building. » 7. The compost is sold in bulk as a soil amendment, probably for landscaping projects.